A blue flag with a large seal centered, showing a mountain and river scene with many animals. 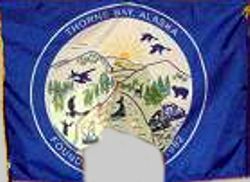 The flag of the City of Thorne Bay, Alaska, consists of blue background with city seal on it. It seems that blue on the city flag is lighter then on the state flag. It can be seen behind the Vice-Mayor photo here: www.thornebay-ak.gov/City_Employees.html. "Thorne Bay is a city in Prince of Wales-Hyder Census Area, Alaska, United States. At the 2000 census the population was 557. Thorne Bay originally began as a large logging camp for the Ketchikan Pulp Company in 1960 that was originally located in Hollis. Being a floating camp at the time, most Hollis residents resided in float houses. In the 1960s and 1970s it was the largest logging camp in North America and was host to over 1500 residents at its peak. It became a second-class city in 1982." - from Wikipedia: en.wikipedia.org/wiki/Thorne_Bay,_Alaska.